Samlesbury Hall, near Preston in Lancashire, will become a 'bleak house' this December as AtmosFEAR! Entertainment Group, based in Lancaster, and creators of major scare entertainment attractions throughout Europe, give the hall a spooky seasonal makeover to transform it into 'Charles Dickens' Haunted Mansion' - a festive Christmas experience aimed at families and children. Meet the ghosts of past, present and future as you experience Dickens' classic Christmas ghost stories in four dimensions. Your blood will freeze this Yuletide at Charles Dickens' Haunted Mansion, a fright before Christmas that will deliver a festive spine-tingle designed with all audiences in mind. 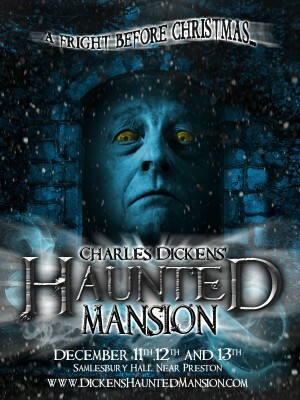 Charles Dickens' Haunted Mansion will open its doors on 11th, 12th and 13th December 2012, from 5.30pm with last entry at 9.30pm. The experience lasts approximately 30 minutes and guests enter the mansion in groups of 10 every 5 minutes. The experience is a walking exploration of the mansion with live 'ghosts' and special effects, it includes staircases. Tickets are £8.50 adults, £6.50 children under 14 years of age. Advance booking is recommended. Please call 01254 812010 to book.